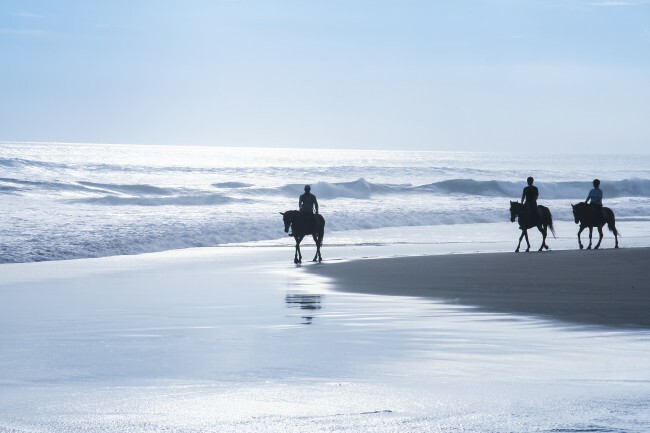 We offer guided horse riding along the unspoilt beach and are situated in front of the Wild Coast Sun. Our rides cater for first time riders and experienced riders. We also have short rides for the little ones. The beach has a wide variety of interesting sights. We are nestled in front of Thomsons Lagoon which holds a variety of fish which the Fish Eagles love. We have a lot of bird life that surrounds the area. From tiny little Sand Pipers, Black Smith Plovers, Egrets etc. Beautiful, breath taking wide open beaches, which lead you to the petrified forest which is visible at Low tide. These have ancient fossils which can be seen while riding past on your horse. The trail continues on to the caves, which have a variety of fossils. You can see the entrances to the caves. Fresh flora covering the entrances, giving it a tranquil feeling, with fresh mountain streams falling from the tops of the caves. The beach continues on until you reach the Mzamba river. Here you are able to enjoy the scenery of the river and the views of the gorge, as far as the eye can see.